We all know that Onam is the annual Hindu festival celebrated in Kerala. The festival commemorates the Vamana avatar of Lord Vishnu and the homecoming of the emperor Mahabali. Mahabali is the grandson of Kind Prahalada. King Mahabali, who is also a devotee of Lord Vishnu comes to powder by defeating the Devas. When they approached Lord Vishnu for help, Vishnu decides to test Mahabali devotion instead of raising the weapon against him to get the lands back for Devas. Vishnu takes the avatar of a dwarf boy, Vamana and comes to King Bali. When the King does yajna (homa), Vamana approaches him and asks for property right over a piece of land that measures “three paces”. Mahabali agrees. Vamana grew big and covers the entire land ruled by King Bali in just two paces leaving him with nothing. Finally, the king offers himself for the third pace. Lord Vishnu reveals himself and grants him a boon that he can visit the land he ruled every year. 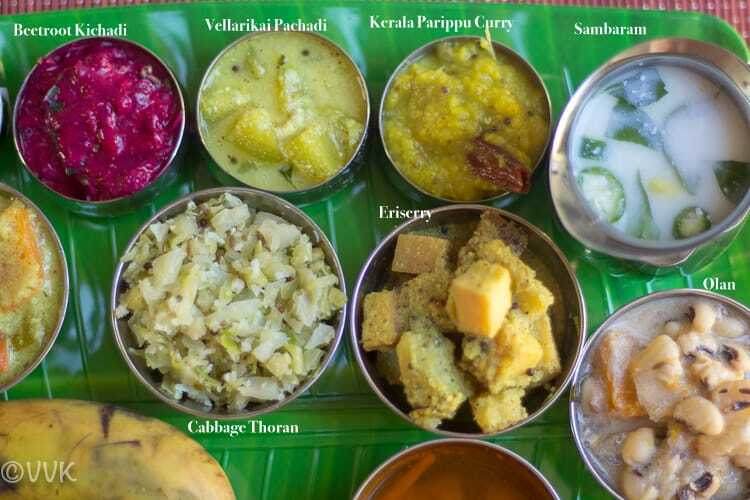 This revisit of King Mahabali marks the festival of Onam and the last day of his stay is celebrated with this delicious vegetarian feast called onasadya. I have to post quite a few from this list which I will be posting soon. So stay tuned for the updates. And today as part of the thali, I posted the beetroot kichadi recipe. :-) The other recipes that are on my blog are linked below. 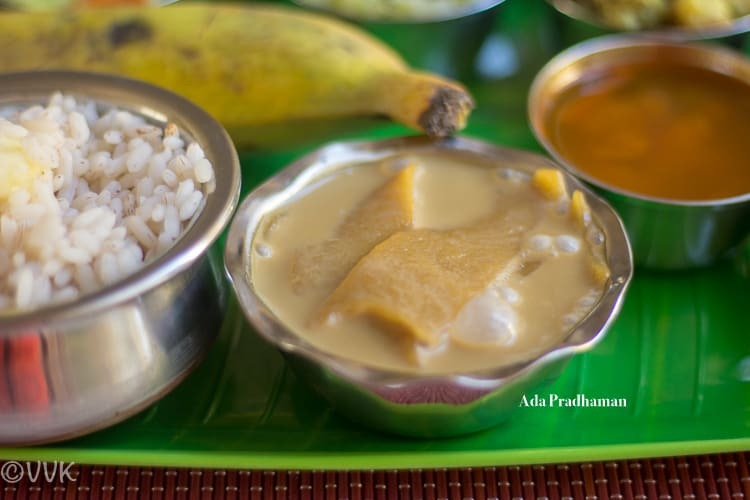 Ada Pradhaman – A delicious coconut milk kheer prepared with jaggery and rice noodles called Ada. 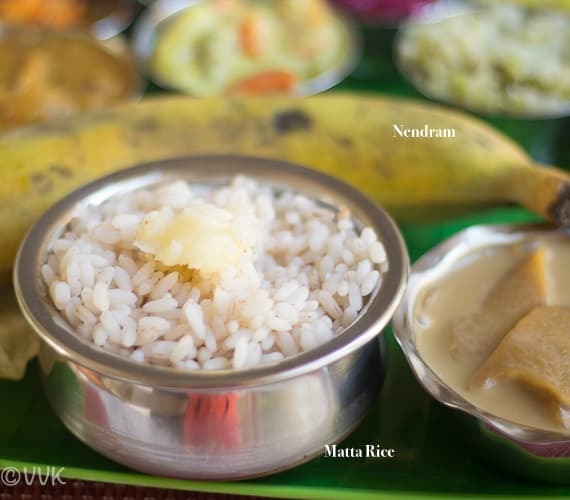 Matta Rice with Ghee – An earthy red parboiled rice native to Kerala. Kerala Style Tomato Rasam – A bit spicy but a comforting rasam with garlic, pepper and tomato flavor. Cabbage Thoran – Kerala style cabbage stir fry with coconut. I prepared it like my Jackfruit seed thoran but without shallots. 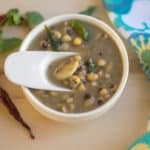 Olan – Kerala Sadya special recipe Olan – the rich, mild and creamy coconut milk stew with the goodness of black-eyed peas/cowpeas, red and white pumpkin. 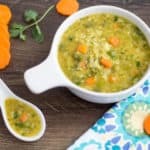 Avial – Yet another medley of vegetables in a simple coconut yogurt gravy. Beetroot Kichadi – A vibrant, healthy and easy to make Kerala style Kichadi / Mildly sweet yogurt relish with beets. Cucumber Pachadi – A cool cucumber relish with mustard seed flavor. 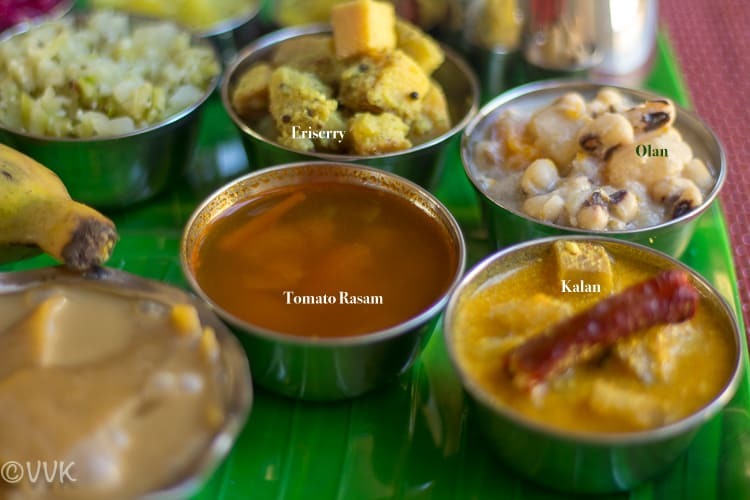 Theeyal – Usually, Sambar is prepared during the feast. But theeyal is also prepared in some part of Kerala. So I went with this delicious shallots theeyal. Kalan – Kalan is prepared with yam or plantain or with both. 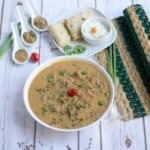 Delicious gravy simmered in the coconut-yogurt sauce. 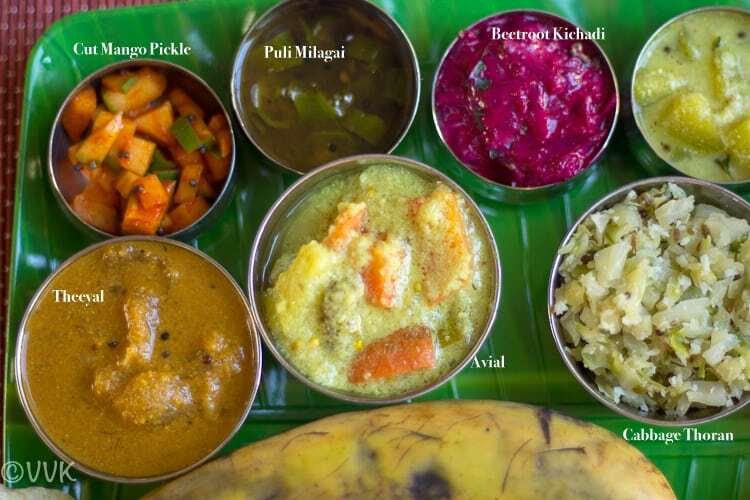 Puli Milagai – This version of puli milagai might not be authentic one that they prepare in Kerala. But it is adapted from the puli inji recipe. I learned this from my mom and ours usually has more chilies than ginger. 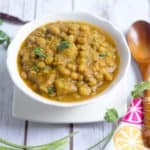 Parippu Curry – Kerala style moong dal tadka with coconut and shallots. What an elaborate spread!! Absolutely divine! Cant take off eyes from your drool-worthy pics! Wow vidhya what a spread!!! Totally mahabali!! I would love to enjoy a sadhya meal, but not lucky yet!!! Onam is one of my favorite festivals and I miss the banana leaf sadyas we have back home, though I do make a sadya every year here. Everything looks delicious. Btw, despite its religious connotations, Onam is the one of the festivals that is celebrated by everyone in Kerala, no matter what their religious faith. Very true. I read about that as well. :-) Thanks Jayashree. 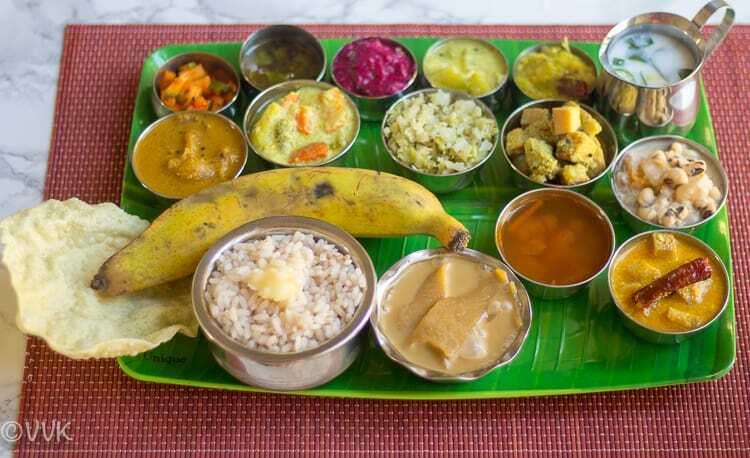 You are rocking with your amazing thalis Srividhya. I only wish to make Onam Sadya but don’t know if that day would ever come. Such an elaborate spread. I am surely it must have taken a lot of effort on your part to prepare everything! kudos! Thanks, Jyoti. :-) MIL did help with few dishes. Omg, what a lovely array of delightful dishes, Cant take my eyes from your spread Vidhya. All those foods are seriously tempting and prefect to enjoy them without any fuss. Kudos to you to come up with loads of delicious sadya dishes. Love this to the core.. Kerala food is always a bliss.. Last onam i cooked and clicked a sadhya .. Looking forward for next onam .. Visual treat!! Bliss is the word. I agree :-) Will go check out your Thali as well da. Sadya ! One meal I love ! I can see all the effort going in there . The amount of hard work . Absolutely astonishing and commendable Vidhya . 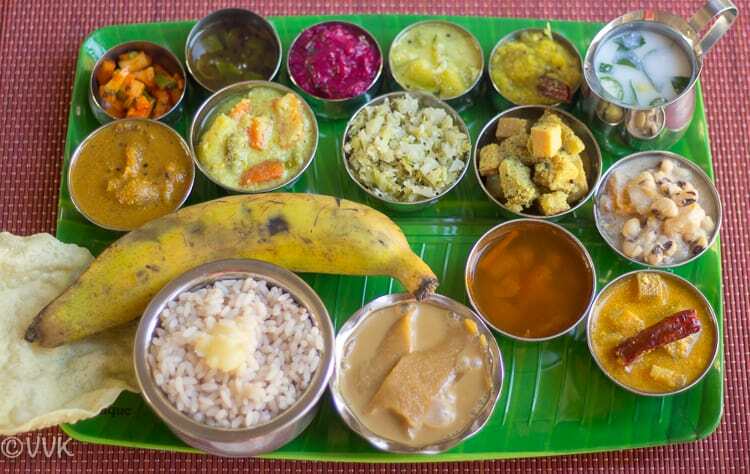 I still remember my daughter helping me with the preparation of the Sadya I prepared , it was tough for a North Indian to make these new dishes , but we all loved the meal . Olan was one of the high rankers . I love Olan too. :-) Thanks much for your kind and appreciating words Vaishali. Wow, drooling over the spread. 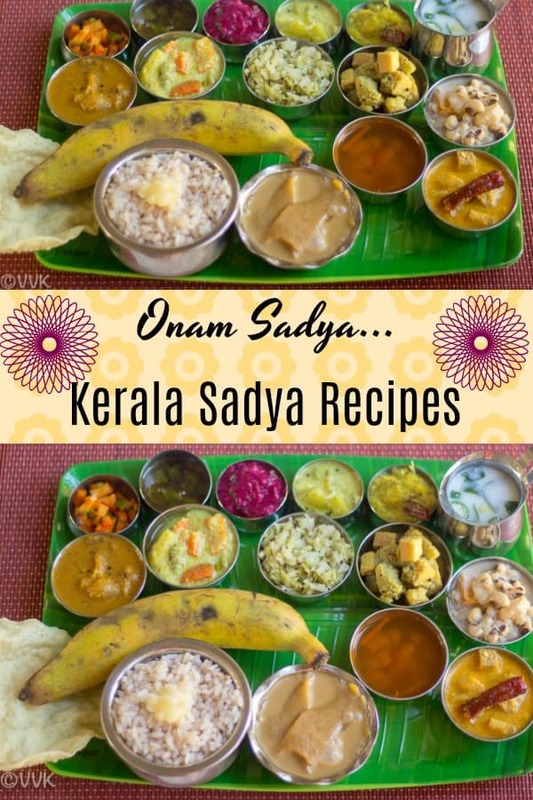 The writeup about onam sadya refreshed my memory. That plate is so cool and a good one to use when one can’t find the fresh leaf. Thanks a lot, Usha. Yeah, I was looking for leaf shaped plate itself but found only this. But no complaints though. Thanks a lot for your appreciating words Manjula. Thanks, Harini. I couldn’t get the fresh ones here. 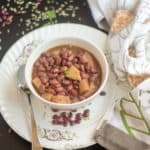 I love Sadya dishes and drooling over this spread you got here!..If you plan well ahead, this is quite easy to assemble right..so satisfying in the end!